As a recent or soon-to-be retiree, you've likely been heavily focused on your career and walled up inside an office for years and years. And while the work and your overall career no doubt was satisfying, getting out to enjoy Mother Nature and all of life's wonders may not have been in the cards. 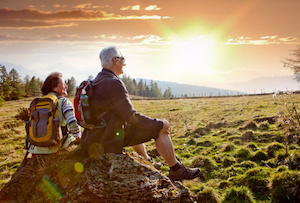 But with retirement right around the corner, your focus should now be on starting to relax and enjoy life — and there’s not a better way to do so than by taking it outdoors. Of course, the benefits of staying active later in life are numerous, as even dedicating 20 minutes a day to exercise can pay tremendous benefits over time. Conversely, you've likely seen what happens when colleagues, friends and other people your age decide to retire to an easy chair. Indeed, leading such a sedentary lifestyle can lead to any number of health scares. With that in mind, it's imperative to keep your body and mind fit, while simultaneously embracing what the great outdoors has to offer. Here is a compilation of tips and suggestions to consider for staying active. Just being outdoors can provide numerous health benefits and lead to a better quality of life as we grow older. From light walking in green spaces to jogging on local hiking trails, the options are certainly endless for today's baby boomers. But for many older adults with limited mobility, gaining access to walkable spaces can prove difficult, especially if steps, distance, busy roads and other obstacles dissuade them or hinder their ability to get outdoors. Still, there are plenty of opportunities to enjoy what Mother Nature has to offer for those able and willing. In particular, sunshine and fresh air are wonderful elixirs that promote positive well-being. Being in the sunshine for a few minutes a day will let your body produce more of the healing powers of Vitamin D. Plus, increased production of melatonin and endorphins will improve mental focus and put you in a better mood. Now that’s something we can all be happy to experience. Remember the days of your youth? While camping may have been an enjoyable activity in your formative years, it may not be at the top of your to-do list as a retiree. But perhaps it's a matter of a changed mindset. Indeed, outdoor camping has changed a lot over the years, and tent camping, in particular, is seen by many as a comfortable and relaxing experience. Truthfully, the options are endless. Camp somewhere off the beaten path or spend a few days at a state park; just make sure, however, you have your walking and hiking shoes. If you need help choosing the right gear, consider stopping by popular outdoor retailers like REI and Cabela's, both of which offer great selections. You can also find helpful how-to guides on their respective company websites.